The title of this plan appears in English and French along the top of the plate, along with the scale bars. The publisher's imprint and dedication to John, Duke of Montague, feature below the plan. Allegorical figures are depicted at bottom centre holding the Duke's coat of arms. 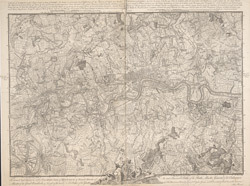 The border of the map is divided in degrees of longitude from the old meridian at St Paul's.